Is your kid a dipper? Lots of moms tell me that their little ones will eat almost anything if they can dip it in something. My son has not gotten on board with dipping. But I keep serving dips to him anyway since every once in awhile he surprises me and tries something new. The one thing he will dip food in is maple syrup–surprise, surprise. Haha! I thought it would be fun to branch out from the usuals- ketchup, ranch, bbq sauce, hummus, peanut butter, etc. Not that there’s anything wrong with those! And, I supercharged these new dips with hidden veggies. A lot of times my son just doesn’t like the way something looks. So, I try to either make his foods look fun, like with fun colors or shapes, or try to make them look like something I know he already likes. Toddlers are complicated little creatures, I’ll tell ya! These recipes require a little more work than just opening a bottle and pouring, but I promise, they’re worth it! Isn’t this a pretty pastel pink? If you want a brighter pink color, I’d suggest adding some beet powder (I saw it in the bulk section at my Whole Foods). This couldn’t be any simpler. I used store bought hummus, added about half the tub to my mini food processor, and added 2 or 3 slices of canned beets. (Make sure to get the plain kind, not the pickled ones.) Process until smooth! I used the rest of the beets for my lunch salads throughout the week. You can use fresh cooked beets too, I just didn’t feel like taking the extra step this time. Or, anytime. I’m a lazy cook. I told my son this was frosting, since he obviously loves frosting on cake and cupcakes. 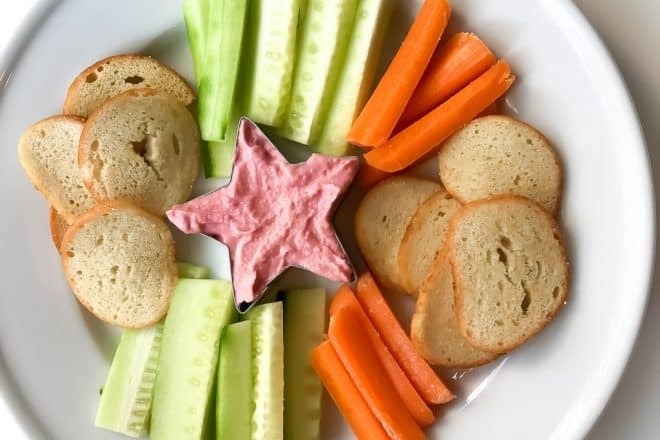 You can use this either as a dip, or as a spread, like I did here! Isn’t this the most perfect little fall snack??? Here’s the recipe. Mash 1 small peeled sweet potato, mine was about the size of my palm. I microwaved it whole and then scooped out the flesh and mashed it with a fork. You can also bake or steam it, whatever you feel like. Make sure it’s very soft so the mixture will be smooth. Then stir it together with 2-3 tablespoons cream cheese, a teaspoon or two of date paste or maple syrup, and a shake of cinnamon. I used date paste since I happened to make a batch the same day, but I’m sure maple syrup would work perfectly. Serve on graham crackers, with apple slices, spread on a banana, or on toast or waffles. This would also be fabulous as a dip for Annie’s bunnies or animal crackers. Totally takes me back to my Dunkaroos days. Anyone else love those as a kid? ?